The Birmingham Cross-City South has finally been completed, and I'm pleased to announce the official release of the route! X-City Slideshow Please read the information on the Download page carefully, as it explains the "Detail Levels", hardware requirements, and any other issues you need to be aware of before installing and running the route. Some of the highlights to look out for are also outlined. 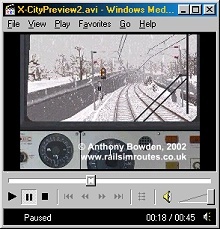 The Cross-City South has from the outset, been designed to feature more detail than other UK based main line BVE routes at the time of release, in order to see what BVE is capable of; therefore the route is best experienced by running the High Detail routes on a fast PC with a processor in the order of 1GHz, combined with a high quality graphics card such as those in the GeForce range. The Standard and Low Detail routes are designed to cater for users with slower PC's, however even these are more demanding than many other BVE routes. The performance of each detail level is not equivalent to the performance experienced with Watford Junction to Milton Keynes, and overall the Cross-City South is more demanding than WJ-MKC. At all detail levels, it is highly likely that slower framerates will be experienced at Birmingham New Street station, due to the large number of tracks and station details. Visitors to the site will have noticed some new banners added to some of the pages; these are all part of a new initiative by members of the railsim community to inform and educate people about the dangers and risks involved with trespass and vandalism on the railways. It is hoped the Trainsimmers Against Trespass campaign will help to deter at least some of the highly dangerous acts of trespass and vandalism on our railways, and at the very least raise awareness of this most serious of issues which can, and does, result in tragic consequences. Please show your support for the campaign by clicking the banners to visit the Trainsimmers Against Trespass campaign page, where some facts, figures and other literature can be read regarding this serious subject. If you operate a rail related website, why not help the rail sim community to spread the anti-trespass and vandalism message to more people, by visiting the campaign page and downloading the banner pack? Simply add the banner or banners to your website, and a link back to your site will be provided on the campaign pages, to thank you for your support. Full instructions can be found on the campaign page. Also, if you have been affected by trespass and vandalism on the railway, as a railway worker or a passenger, and have any stories you'd like to tell, please visit the Campaign Page for details about how you can share your experiences (anonymously if you wish), and hopefully make people stop and think before carrying out any acts of trespass and vandalism. Chris Cooper has been busy creating another excellent train for BVE users to enjoy, and Chris' latest project - the Class 303 25kV AC EMU - is now available from the Multiple Units section of the recently formed BVE UK Train Collection, a joint effort between Rail Sim Routes UK and Scottish Rail Sim Files. The class 303 features a photo-realistic cab, using one of Ben Martill's superb cab photos; and some excellent samples such as the emegency brake sounds. Download the new EMU from the BVE UK Train Collection. Good news for fans of the Class 321 and the West Coast Main Line! Steve Green has been working hard to produce an all new Class 321 25kV AC EMU complete with animated full height panel, along with some new variations of the High Detail versions of my own Watford Junction to Milton Keynes Central route. Four new route files are provided - Semi-fast and Slow Silverlink timetables, in both Summer and Winter variations. Firstly, download the new WJ-MKC Cl321 Add-on here, or from the Add-ons section of the WJ-MKC Download page, and then head over to Steve's Train Sim Central to download the new Class 321 from the "BVE Trains" section. There are some new 3D train textures included with the add-on, both Steve and myself hope you enjoy this latest train and route combination! In a joint effort, Rail Sim Routes UK and Scottish Rail Sim Files have joined forces to bring you an all new BVE UK Train Collection (replacing the old BVE Locomotive Collection) which offers a simple and convenient place to download all the trains that were previously available or duplicated on both sites. This move will make file management easier and ensure the same versions of the trains are always available from one source, without having duplicated files or having to switch between either site to find add-ons for the trains. The new BVE UK Train Collection also has it's own URL - http://bvetrains.cjb.net. Both Robert Glass and myself hope you find the new train collection easier to navigate and more convenient. If you have any comments, please don't hesitate to contact either of us. To launch the new sew site, one completely new EMU and an updated BVE loco are now available. Firstly, a new Class 325 Dual Voltage "Post Office" unit by Chris Cooper is now available from the new BVE UK Train Collection. The unit features a superb photo-realistic panel by Chris, and thanks goes to Steve Green for allowing some sounds from his cl465 unit to be used. The 325 is ideal for running on Steve's Southern Electric route, or my own Watford Junction to Milton Kenyes Central route. Visit the new BVE UK Train Collection to download this latest addition. Steve has also recently released an excellent Class 442 "Wessex Electric" and updated Southern Route files with new signalling and timetables, which I thoroughly recommend! Download the unit and route updates from Train Sim Central. As part of the re-structuring of the way in which locos and units are made available from this site, I have also discontinued the WJ-MKC specific versions of the Class 87 AC electric loco and Steve's Class 310 EMU, and now a single class 310 and class 87 are available in their place; installing to the "BR_Class87" and "Cl310" train folders. I have also updated the Watford Junction to Milton Keynes Central route files to use these "standard" train folders instead. This should reduce some of the unneccesary and potentially confusing duplication of train folders. Feedback about the Class 220 Voyager revealed that the performance of the train wasn't up to scratch (my fault! ), therefore a new version of the 220 is now available from the BVE Locomotive Collection, which has improved acceleration characteristics and a more realistic time is now taken to reach 125 mph. Thanks goes to Steve Green (www.trainsimcentral.co.uk) for assisting with the Voyager's Train.dat file and improving the acceleration characteristics (great job! ), and for testing the train. I have also amended the calibration of the speedometer as the indicated speed wasn't as accurate as it could have been. The performance achieved by the 220, does seem to vary depending on whether the train is run on an RW based route (like Watford Jn to Milton Keynes) or a CSV based route, therefore an alternative Train.dat file better suited to running on RW based routes is also available as a patch. The updated Voyager and choice of Train.dat files can be downloaded here. The second Cross-City South Preview Video can be downloaded here. The file comes in at 5.7MB, and is 45 seconds long, and features 4 seperate but slightly longer duration scenes. The video is in the same format as the first Cross-City Preview video. Please note: the video is recorded at 15 frames per second, but is a little jerky due to the compression. The High Detail route is featured, with 600m Drawing Distance set, and at the time of recording it was running smoothly at 29 fps at all locations featured. This video clip does not reflect the actual performance of the route in any way. No part of this file, video or audio, may be reproduced or extracted without permission. It gives me great pleasure to announce a new additon to the collection of trains hosted within the BVE Locomotive Collection - the new Class 220 "Voyager" by Ben Martill. 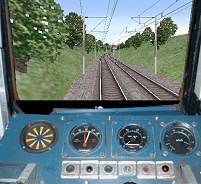 The unit features a fully authentic and photo-realistic full height cab, and the train can be downloaded from the bottom of the BVE Locomotive Collection page. Special thanks goes to Steve Green (www.trainsimcentral.co.uk), who has kindly allowed his excellent class 170 files to be used in the making of the Voyager. Now for an update on the Birmingham Cross-City. Progress is now being made at a steady pace, and the focus has now shifted to perfecting the sound effects used within the route(s) to make the route even more realistic. The route now features fully authentic passing train sounds (actual recordings of the trains themselves); for example you can now hear the engine sounds of different classes as you pass them, with more realistic coach sounds. Birmingham New Street has also had auto-announcements added to enhance the atmosphere of this location. If you would like to preview these new sound effects, and see some highlights of the new class 323 and Dawn and Daytime routes in full motion, why not download the Cross-City South Preview Video? The file comes in at 5.5MB, and is 49 seconds long, and features 5 seperate scenes. The video is in AVI format, 240x180 pixels, 11KHz 8 bit audio; and you'll need the Indeo 5.04 codec to view it, this comes as standard with Windows Media Player. I would recommend viewing the video at a zoom setting of 100% only, so it doesn't appear too blocky. All sound effects are recorded from the route (the quality is twice as good in reality), and no "audio dubbing" has taken place! Please note: the video is recorded at 15 frames per second, but is a little jerky due to the compression. The High Detail route is featured, with 600m Drawing Distance set, and at the time of recording it was running smoothly at 29 fps everywhere except New Street (15 fps). This video clip does not reflect the actual performance of the route in any way. The new full height 480x440 cab overlay graphics for several of the locos in the BVE Locomotive Collection are now finished, and ready for download. The class 20, 37, 40, 55 and 87 have all been updated, the class 50 will follow soon. All these locos now feature fully animated power and brake controllers, ammeters and so-on; and the 87 includes animated notch indicators as well. Please note - you must have the latest version of BVE, version 2.03.0008 installed to use these updated BVE locos. The new full height, animated panels are now included as standard within these main loco downloads to make installation easier. If however, you experience any problems with the new panels such as poor performance and slow framerates in routes, other graphical anomolies, or are still using an older version of BVE, then the old 480x240 panels can be downloaded in the form of patches. These old style panels have also been updated with animated controls. If you wish to use the new full height panel graphics with the 87 available as part of the Watford Junction to Milton Keynes route, please download the WJ-MKC Trains file which includes the new panel, otherwise head over to the BVE Locomotive Collection to download the new locos. Whilst on the subject of BVE locomotives, Bryan Dudley has released a new loco - the class 35 "Hymek". This loco can be downloaded from Bryan's Railtech site. One of the finest LUL routes to date has just been released - Paul Jobber's stunning Circle Line route running from Aldgate to Edgware Road. There's as much variety and detail as you could possibly wish for, and some of the track layouts and stations are superbly detailed! Whatever your level of interest in LUL routes, this one is a must download. The route and C69 LUL stock can be downloaded from Steve Green's Train Sim Central, which now has a new URL - www.trainsimcentral.co.uk. It's been a good week for developments with BVE locomotives and trains. Bryan Dudley has released a superb looking full panel update for the Class 37, the details and download can be found on Bryan's Railtech site. Perfect for running on Don Clarke's Edinburgh to Dundee route. Also, a superb new class 170 "Turbostar" has been released, complete with some superb engine sounds and outstanding horn samples! The unit can be downloaded from Steve's Train Sim Central. I can also announce more details about my plans to update the loco panels within the BVE Locomotive Collection. I've already started animating all the panels which are not yet animated; namely the Class 20, 40, 52, and 87. I'm also updating the panels to include new 480x440 cab view "overlay" graphics which can be used with the latest release of BVE, version 2.03.0008. These will be made available as soon as possible, but as they have to be animated as well, it will take me a little longer, sorry! The existing panels will still be available for those who are having problems with the new version of BVE, or for those who notice a reduction in performance due to the overlay graphics. The new release of BVE (version 2.03.0008) now available from Mackoy's site, includes a fantastic new improvement, namely the overlaying of the panel bitmap over the 3D view through the use of transparency, creating a far more convincing in-cab environment. BVE developers are already taking advantage of the new feature and updating their trains accordingly. Robert Glass has updated his Class 47, 56 and 158 trains with the new cab-views, and they can be downloaded from the Trains section of Scottish Rail Sim Files. Steve Green has also been updating some of his BVE trains, and excellent new cab-views for the Class 465, 4-CIG, HST and 1995 LUL stock are available from his Train Sim Central site. I also hope to announce plans for the upgrading of the loco panels for those trains included in the BVE Locomotive Collection shortly, watch this space! Please note that these panel updates are available as add-ons to the original trains - the new panels will only work with the latest BVE version 2.03.0008! I'm also pleased to announce that Don Clarke has updated his excellent Edinburgh to Dundee route, which now includes improved signalling amongst other enhancements - either a pair of 37's or a Class 158 can be used, and this is a thoroughly enjoyable route to drive and well worth the download! You can find the route and Class 37s on Don's SRPS C&W Dept site, and you can also find the Class 158 on Robert Glass' ScotRailSim site. Time for a quick update on my progress with the Cross-City South route. The route's release is getting nearer, as several variants of the original Daytime Summer route are nearing completion - namely the new Dusk, Midnight ECS and Dawn versions of the route. The Dusk version features my own implementation of the excellent "Graduated Lighting Effects" technique developed by Bryan Dudley, which you can see in Bryan's Watford Jn to Milton Keynes Central Dusk-Night Route, or the stunning Sandymill Late Train. The Midnight ECS run features darkness and headlight effects using BVE2's fog commands, and also includes such highlights as floodlit engineering works and non-stop running all the way to New St. The Dawn version features realistic backdrops with effective lighting; all the routes feature some new BVE 3D train objects which haven't appeared in any other routes to date. Take a look at the new Dusk, Midnight ECS and Dawn screenshots page to see some of these features! I have been informed of a minor bug in the Medium Detail Class 310 Summer route file, which means the derailment error the WJ-MKC Patch was meant to fix still remains in this Medium Detail route file. My apologies to users of the Medium Detail routes, and if you've already downloaded the patch or the new v1.1 main downloads, a route file update can be downloaded here. I have also updated the WJ-MKC Patch, and the High Detail Main Download with the corrected route file. For those who haven't downloaded version 1.1 of Watford Jn to Milton Keynes yet, see the news item below for the details. Paul Jobber has finished his excellent update to Sacha Dodd's great Victoria Line LUL route, and there are now 16 route files to choose from, set in both 1975 and 2002, with both ATO and manual control options! See the Crotrainz news item dated 24/02/2002 for the details and the downloads. It gives me great pleasure to announce another addition to the fleet of BR locos available for BVE - the Class 56 diesel-electric locomotive originally by Phillip Mackay, and now updated by Robert Glass (with a little help from myself). As with the Class 47, the 56 now features a fully animated panel, realistic sounds, whistle sounds by Alan Perryman (http://lumbutts.tripod.com), and an excellent horn sample courtesy of Andy Slater (www.brdw.co.uk). The Class 56 can be downloaded from either the BVE Locomotive Page on this site, or the 'Trains' section of Robert Glass' Scottish Rail Sim Files. We hope you enjoy the loco! "Error 16" messages - A few people have experienced this dreaded error at most stations along the line, and the new patch removes markers from display while passing the stopping points at stations. Hopefully this will eliminate this annoying problem for some users. Lack of warning for upcoming stations and speed restrictions - the patch addresses these issues by displaying new station name markers approx. 1 km before stations which must be stopped at; and relevant permenant speed restriction markers appear earlier than was previously the case. Class 310 "Derailing" bug - Since the release of the XP compatible version of BVE, another bug cropped up whereby the class 310 would veer alarmingly off the track when crossing the pointwork just before Hemel Hempstead station. This problem is addressed by the patch. For those who are interested, it is caused when a "Turn" command is used on a section of track which already has a "Curve" command applied to it. Removing the "Curve" command and adjusting the "Turn" values to compensate will fix this problem. New photo-realistic backdrop for the Summer routes - Thanks to Bryan Dudley (http://railtech.topcities.com), an excellent new backdrop is included, which enhances the appearance of the Summer scenery considerably. An improved Transparent Texture Pack For GeForce and ATi graphics card users is also available. Several transparencies in the old "GeForce Replacement Texture Pack" did not work correctly (some catenary gantries were missing, and masts weren't properly 'connected' to some gantries). Some buildings also appeared with transparent patches in the walls. The updated Replacement Texture Pack resolves these issues. The intense green colour of the overhead line equipment has also been toned down. Note that for the correct display of some 3D objects, you need to upgrade to v1.1 of WJ-MKC first (re-download the files on the Download Page) or download the Patch. Once done, the new Replacement Texture Pack can be downloaded here. In other news, Phil Brooke has returned to the BVE scene, and re-launched his excellent BVE Hull website at a new URL - http://bvehull.bravepages.com. Watch out for the development of the Hull to Sheffield route over the coming weeks! Of course, the fictional Brookfield Interchange route is now available once again from Phil's site. I'd also like to take this opportunity to remind anyone starting up or running any BVE websites, that I do not appreciate anyone placing direct links to my files on their webpages. However, I don't mind in the least if my homepage is linked to. Also please remember to ask my permission before using any of the material available for download on this site in your own routes or on your own websites. A quick update on the progress of the X-City; the Winter version of the route is well on it's way to completion, and some new screenshots designed to make waiting for the route's release all the more difficult, can be found on the X-City Winter Screenshots page. ;o) Look out for the weather effects! Work is also underway, on the Standard and Low Detail versions of the route; initial indications are that parts of these routes perform nearly as well as the equivalent Watford Jn - Milton Keynes detail levels, however because the stations (and associated details) are far more frequent, performance will be more variable throughout the routes on slower machines. New St station will really test slower computers, and understandably framerates won't be spectacular - the BVE drawing distance may well need to be reduced. On a fast PC, there's no problem of course! In other news - Alan Lee has changed the URL to his Jubilee Line website, which is now www.jubileeline.org.uk. Don't forget to update your bookmarks or add the site to your favourites list, as Alan's site is worth checking regularly. A few people have been lucky enough to try a "Pre-Beta" preview of the Birmingham Cross-City South, and one of these lucky people is Alan Lee. He's been very kind indeed, and written an entire review of the route, and you can read all the details at Alan's excellent Jubilee Line website. Thanks a million, Alan! Now for the long awaited update on the development of the Cross-City South route. I'm pleased to say that the High Detail route is very nearly finished, and Birmingham New Street station has finally been completed. It's a real feast for the eyes, however a fast PC will be needed to see all the detail at an acceptable framerate with a longer Drawing Distance set - this is one of the most extensive, demanding and complex 3D scenes to appear in any UK BVE route to date! The High Detail route also introduces three new features to overhead electrified lines in BVE. The catenary detail in the Cross-City goes much further than that acheived with Watford Junction to Milton Keynes - very realistic overlaps are now modelled with one tension length terminating and another starting; wiring over pointwork is now authentic, with additional wiring runs and section insulators in the correct places, and best of all - even on curves the wires run in a straight line from mast to mast, regardless of the distance between the supports; in other words the wires don't curve along with the track like they do in WJ-MKC for example. A very good PC will be necessary to see this detail however. The quality of the "Replacement Textures" designed for use with GeForce graphics cards has also been enhanced, with some finer details now included. The overall effect when using these is also much neater now. Expect a Texture Patch to improve the appearance of WJ-MKC's catenary when used with GeForce cards, to appear in the not too distant future. Good news for fans of both the London Underground and the West Coast Main Line - the author of the original Bakerloo Line, Paul Jobber, has just finished his fantastic Bakerloo Line Extension from Queen's Park, which now runs alongside the four track WCML all the way to Harrow and Wealdstone, between London Euston and Watford Junction. The existing section from Elephant and Castle to Queen's Park has also been revised, and on the new section to Harrow look out for the busy traffic on the WCML, and the superbly detailed stations, lineside structures and scenery. There's even a bonus route included! Head over to Steve Green's Train Sim Central to download Paul's masterpiece. The Class 47 loco is now available (again) from the BVE Locomotive Collection - apologies for it's removal for a second time, this was due to a misunderstanding over ownership of the engine sound files contained within the loco. This has now been resolved, thankfully! I should now be able to continue work with the Cross-City South, please check back soon for progress updates.